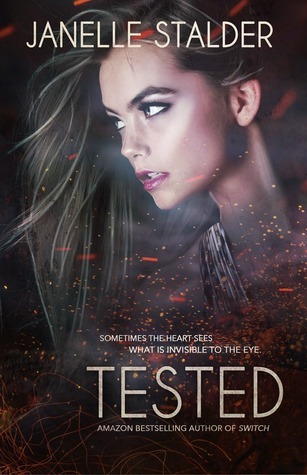 Tested is the newest book in Janelle Stalder’s New Adult Dystopian New World series. This installment brought together Missy and Tyler (who we got glimpses of in the last book). Despite the fact that Missy and Tyler started out with a bit of instalove (but that was started in the last book, so I didn’t have to dwell on it here) and the fact that Tyler was not really himself for part of the book, I found myself really rooting for them as a couple. Stalder had a tricky job here because she had to show us Tyler’s angry, almost monster-like side and still allow us to fall for him. Even when Tyler was living on pure testosterone and instinct, his instinct was to protect Missy. On the other hand, Missy started out as a very timid character, but managed to find her strength throughout the book. And her timidity was based on the fact that she was recovering from an incredibly traumatic past. I thought that the tension between what Missy wanted with Tyler and her fears of men in general were portrayed really well. In the second book in this series, we got a glimpse of the animosity between Trent and Phoenix – these two were always at each other (and you kind of had to wonder if it would develop into something not so antagonistic). Well, in this book, we got to see LOTS more of these two and there were even more hints at something in their future. I won’t spoil what happens, but they get thrown together – and their story leads us into the next book. I love that Stalder finally started one of the couples out with something other than an instant connection (which has been my main complaint about the romances so far). Of course, we also got to see more of Ludwig and the different rebel factions. It seems that there are quite a few unknowns out there still – Ludwig definitely isn’t the only enemy! Okay, there were parts of this book where I was scratching my head a bit. As the synopsis says, Missy infiltrates the enemy in order to try to save Tyler. Except there were times where she just didn’t seem to be hiding all that well. At a few points, Missy is asked to put herself in potentially dangerous situations – where she should have felt frightened of BOTH Tyler and the people asking her. She agrees with very little persuading needed. It just didn’t make sense to me – surely this should have been a major red flag for the people she was supposedly trying to fool. I don’t know why they would even ask her to put herself in the situation in the first place – without a reason (the desire to save Tyler), why would anyone ever say yes? People occasionally seemed slightly suspicious when she agreed over and over again to put herself in harm’s way, but not nearly enough. I really had to suspend disbelief in some of these parts. This was another strong book in the series and it definitely left me wanting more. I can’t wait to see what Stalder does in book #4! 4/5 stars. Sign into Goodreads to see if any of your friends have read Tested.